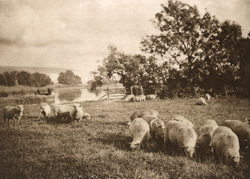 In the descriptive letterpress which accompanies 'Study of Sheep,' Graham Balfour comments on J B B Wellington's success in managing animals as subject matter for his photographic studies. "Of this we have an instance in the 'Study of Sheep,' which brings us back again to Bury. The device employed may not be new, but is worth recording in so happy an example. A small dog will shift the sheep and render them more lively. Here the front group had just moved, and then seeing the dog, in this case a Scotch terrier, was quiet, settled to feed again. But, adds Mr. Wellington, it is advisable to have the dog well in hand. Five seconds later the sheep were rushing across the field with the dog in hot pursuit, and a less expeditious friend missed his picture. To cows, Mr. Wellington feels that he has never yet done full justice, and indeed, considering that few animals are so often photographed in pleasant surroundings, it is wonderful that good cow-pictures should be so rare. It is true that the masterpieces of Troyon and Mauve depend chiefly on harmonies of colour, and that the form of the cow is monotonous and ungainly. And perhaps the frequent failures are due to the fact that 'the kye' are most frequently a subject for literature and not for art, and it is one of Mr. Wellington's surest chaims to be artist that he has never confused the boundaries of these two provinces."